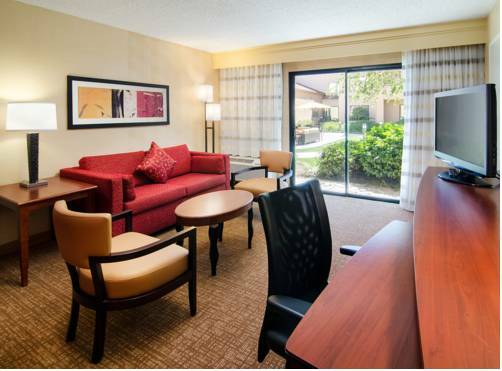 Find your blend of comfort and convenience at Courtyard Bakersfield. Our hotel is located in the San Joaquin Valley right off Kern River, making it the ideal haven for your California vacation. We are also just 7 miles from Meadows Field Airport, so your travel routine is hassle-free. Once you've arrived, explore attractions such as the Kern County Museum and California State University, Bakersfield before heading to our spacious rooms and suites. Our accommodations invite you to unwind on plush bedding as you enjoy complimentary Wi-Fi, a flat-panel TV and views from your private balcony. Wake up feeling refreshed and head to The Bistro for your morning dose of Starbucks coffee and breakfast. After a long day, make your way back for dinner paired with a tasty cocktail. Here on business? Take advantage of our event rooms and on-site business center. When the work is done, release some energy at our fitness center or take a refreshing dip in our pool. Get the most out of your stay at Courtyard Bakersfield. The Bistro Eat. Drink. Connect. : Don't want to venture far for breakfast or happy hour in Bakersfield, CA? Try The Bistro - Eat. Drink. Connect. , our on-site restaurant featuring healthy and delicious breakfast and dinner options as well as Starbucks beverages and an evening bar.